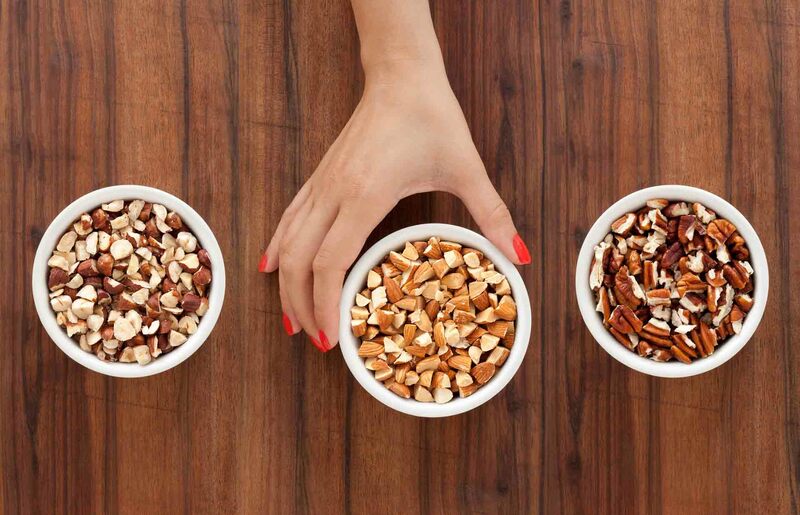 Almonds, cashews, walnuts… nuts are a deliciously crunchy addition to your diet, and they’re full of goodness. Accredited Practising Dietitian Ashleigh Feltham explains why you should get a bit nutty. When you think of nuts, you may picture the pub with a beer. But that small bowl of delicious treats may be better for you than you know. Nuts are only starting to be understood as an important part of the diet, not only for a healthy heart and waistline but a healthy mind too. Nuts are often given a bad rap because of their fat content. The good news is that the fats found in nuts are healthy fats for your body, called polyunsaturated and monounsaturated fats. These types of fats can help your heart and brain work better, and can even help you to maintain a healthy weight. Polyunsaturated fats can boost your brain by supporting the structure of the cells and helping your brain send signals. Walnuts also contain a large amount of a plant form of omega-3 fat (known as ALA or alpha linoleic acid), which is beneficial for brain health. The positive nutritional profile of nuts doesn’t end there. Nuts of are full of vitamins and minerals that support healthy bones, energy production, brain health and heart function. These include B vitamins, calcium, iron, manganese, copper, magnesium, potassium and zinc. Nuts also contain an amino acid called arginine. This helps your blood vessels stay dilated and can help prevent clots in your blood. The antioxidants within nuts help improve immune function, and act to fight the stress and free radicals that occur naturally in the body. An additional bonus is nuts are also low in sodium, which is another win for your heart and blood pressure. Nut are a good source of fibre, particularly prebiotics – a type of fibre that acts as food for the healthy bacteria in your guts. Good gut health is linked to many areas of health, including digestion and immune function. On top of this, soluble fibre keeps LDL cholesterol (the ‘bad’ cholesterol) down. Fibre also keeps you feeling fuller for longer. Making a small handful or 30 g of unsalted nuts your regular go-to snack is a great way to beat the 3:30 pm slump, and prevent the journey to the vending machine for that chocolate bar. While nuts are full of goodness, they should be eaten in moderation. Because they are naturally high in healthy fats, they will add to your daily kilojoule intake fast. The Dietitians Association of Australia suggests one small handful (around 30 g or 1/3 a cup) per day. Ashleigh Feltham is an Accredited Practising Dietitian and owner of Feed Your Future Dietetics. She’s passionate about helping others live a life of health wellness through nutrition, mental health and exercise.